Christmas brought some great kitchen stuff into our house. I can't wait to start using it all!! - Micro Fibre Cleaning Sponge. - Gold Canyon Sweet Cinnaroll Candle...mmmmm. - Mario Batali Garlic Slicer, Spatula and Basting Brush. - Steak Markers...for the GrillMaster. 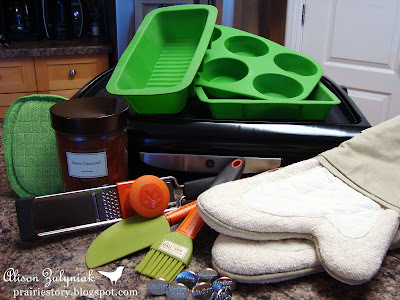 - KitchenAid Oven Mitts...love that they are extra long so I won't burn my arms anymore. - GE Jumbo Griddle...because we love our pancakes! - Silicone Square Cake Pan, Loaf Pan, Jumbo Muffin Pan...my sister-in-law swears by these. - Egg Poacher...bring on the eggs benedict. Thank you family for these great gifts! Wow! Great gifts! Very useful indeed! Love your silicone pans.